Using software and hardware, SiGNL creates smart objects which extend real world experiences, online. 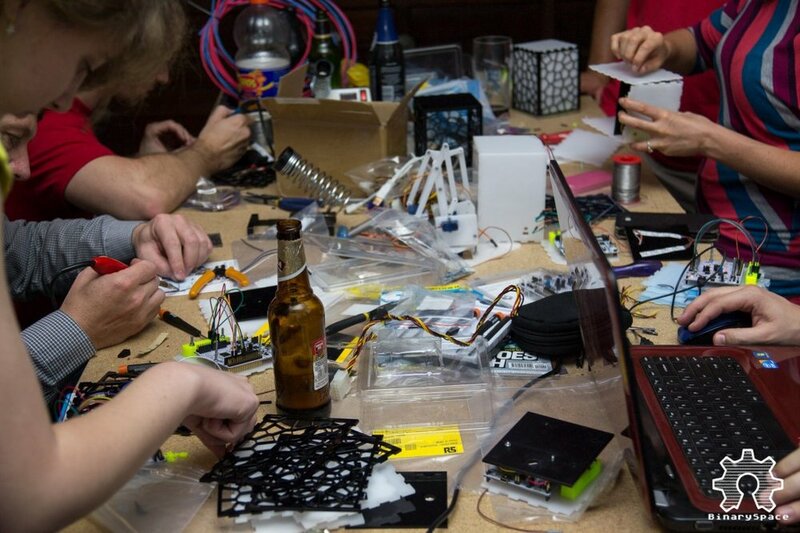 Tom: BinarySpace is a makerspace. It’s a space where people with common interests in technology, science and electronic art, can meet, socialise and/or collaborate. We meet weekly, learning from each other, providing a space where projects can be worked on and new ideas can be developed. It’s a safe space where anyone, regardless of their skill level, is welcome. Tom: BinarySpace was founded in 2012 by Tom Van den Bon and Sebastian Schocke. The space itself is for the members and is run by the members. This means that any BinarySpace member has a say in how the space is run and used. SiGNL: Tell us about your collaboration with SiGNL? How’d it come about and why? Tom: The collaboration started when we were contacted by SiGNL to help on a project. We then realised that there were lots of common interests, but mostly that we all want to do awesome projects. SiGNL has lots of experience on the marketing side and BinarySpace has access to members with various skill sets regarding the technology used in marketing campaigns. By working together, BinarySpace has access to funding for projects and SiGNL has access to a skills library. SiGNL: Since your initial collaboration, BinarySpace and SiGNL have worked together on many projects. What did they entail? Tom: All marketing campaigns require an interactive side to it. You want your customers to interact with the product or interact with the idea/concept. BinarySpace has helped SiGNL on various occasions to bring these interactive concepts to life. This includes making use of technology such as 3D Printing, PCB fabrication, embedded development and prototyping new ideas/concepts to determine viability. SiGNL: What’s in the pipeline for BinarySpace and how do you see your collaboration with SiGNL developing? Tom: BinarySpace is a place for learning and we have various workshops and projects coming up that anyone can participate in to learn new technologies and to improve their skill levels. Improving the skill levels of BinarySpace members and SiGNL employees opens doors to new ideas for products/concepts and cool tech. We are excited about future projects with SiGNL! To find out more about BinarySpace, visit their website.